Home > US Sports > NBA > Has Age Finally Caught Up With Kobe Bryant? April 18, 2013, Kobe Bryant suffered a ruptured Achilles tendon while playing the Golden State Warriors. He limped off the court, but returned to the court to shoot (And Make) two free throws off of one foot. This was a sense of false hope for Los Angeles Lakers fans. He never returned for the 2012-2013 season, including the playoffs, where the struggling Lakers were swept by the Spurs. He was expected to return opening night of the following season, but recovery took longer than team doctors anticipated. Kobe, who normally played through most of his injuries without a care in the world, was at a loss. Kobe returned to the Lakers starting lineup and received a warm welcome from the Lakers home crowd. He began passing the ball at first, seeming hesitant, but slowly and steadily, his offense started to come back to him. His first shot of the season was, you guessed it, an airball. This shot seemed as an omen of things to come in the near future. After his return against the Raptors, Kobe played just five games. 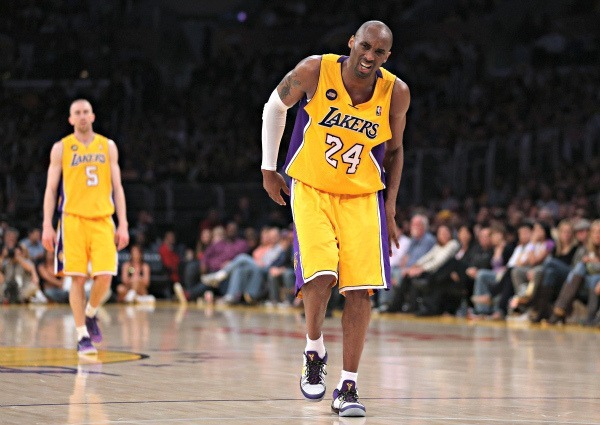 While battling in Memphis against the Grizzlies, Kobe fell down and immediately began to favor his left knee. Bryant finished out the rest of the game, totaling 21 points in just 30 minutes, but unwelcome news came the following day. Team doctors confirmed that he had suffered a broken left knee and that their star player would be out for the rest of the season. The Achilles injury may have been the beginning of the end. We have seen over the years how injuries have affected great players like Dominique Wilkins, Brandon Roy, Tracy Mcgrady, and Yao Ming. So are what are we going to see from one of the most highly decorated players in all of sports?Only time will tell, and for Bryant, there is not much left. We are beginning to see the end of one of basketballs greatest eras, and that era ends with Kobe .